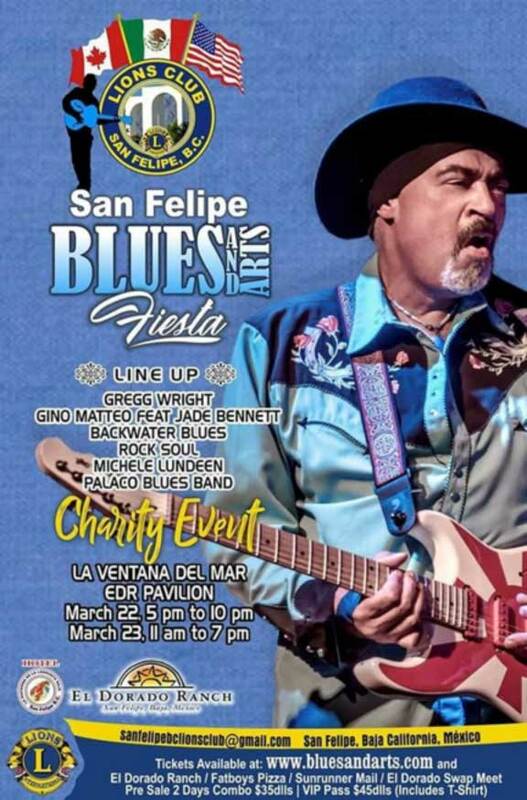 (SAN FELIPE, BAJA, MX) – The San Felipe Lions Club is proud to host the annual San Felipe Blues & Arts Fiesta, once again at the beautiful La Ventana del Mar Resort at El Dorado Ranch Mar 22-23. As the premier fundraising event in Northern Baja, the Blues & Arts Fiesta proceeds directly supports a variety of local charities. This year’s lineup includes Gregg Wright, Gino Matteo Band featuring Jade Bennett, Michele Lundeen, Rock Soul, Palaco Blues Band, and a Backwater Blues Revue. The fun Friday night allstar meet and greet and jam will be at the El Dorado Ranch from 5pm-10pm and the cost is only $15. There will be food and drink available for purchase and attendees can sit comfortably indoors or on the sprawling patio. Concert attendees during Saturday’s 11am-7pm Fiesta sit on a velvet-green lawn looking out over the legendary Sea of Cortez, while watching world class musicians, visiting the booths of the esteemed artists, and enjoying refreshments and great food. Bring a chair or blanket or you can also purchase VIP tickets for a seated/covered area. There is also limited patio seating but is situated apart from the stage. There will be shade available and lots of room to dance the afternoon away into the early evening. The atmosphere is laid-back and the overall location is beautiful. The little fishing village of San Felipe comes alive as the local community welcomes our visitors to share in the Friday and Saturday events. The mission of the Blues & Arts Fiesta is “Changing Lives Through Music and Art.” This event not only showcases musical talent and artists, but is also a joyful celebration of the Lions Club mission. Over 150 volunteers work hard all year for the sole purpose of helping those less fortunate in our community. Please enjoy the show because every one of us are here at Blues & Arts 2019 to support and encourage cooperation among citizens, by offering unconditional compassion for those less fortunate members in our community. If you see a child get glasses for the first time at a Lions Eye Clinic – you will see why this show is so important.